This week Hoboken, New Jersey’s waterfront is hosting the “Hoboken Huddle,” billed as a food and fun-filled event for Super Bowl 2014 attendees, city residents, and anyone else interested in the event’s varied offerings. Interestingly, curling, the centuries-old sport of the stone and broom serves as the Huddle’s featured attractions. Beyond the Super Bowl, curling enthusiasts hope that showcasing the sport at the Huddle will help promote public awareness of the somewhat obscure pursuit in the weeks leading up to 2014 Sochi Olympics, where it has been officially part of the winter Olympics program since the 1998 Nagano games. Although curling and Hoboken, New Jersey may seem like a curious combination, in actuality, the sport and Hoboken share deep-rooted historical bonds. In fact, in the late 1800s, an enclosed rink on the corner of Grand and Twelfth Streets served as the home of the New York Thistle Curling Association, at the time one of the United States’ premier curling clubs. On January 14, 1893, the New York Herald reported that the Thistle’s “old fashioned house warming” celebrating its “new club house adjoining the rink,” had attracted “fully four hundred curlers” the previous day. According to the Herald, highlights of the gala opening included a match comprised of curlers from “[a]ll the prominent clubs in the East,” including a contingent of “old-time curlers” who were purportedly “over seventy-five years of age”. After the match concluded, the festivities wrapped up with an evening dance. (“A Gala Time for Curlers,” New York Herald, January 14, 1893, 8). The Hoboken rink, among the first in North America to install electric lights, also hosted a variety of skating events including a “national medal” match between the John o’ Groat and Empire Curling Clubs and the National Amateur Skating Association’s annual figure skating championship in January and February 1893 respectively (“The Thistles are Good Curlers;” “General Sporting Notes”). During the afternoon a point competition was held between members of the Thistle Club. The prize, a handsome gold medal, was carried off after a spirited contest by Robert Lander, who retired from the rink with the creditable score of 20. In the evening a spirited match for a beef and greens dinner was played on rink No. 1 between members of the Excelsior Curling Club. Mr. Detrich’s team was victorious by a score of 17 to 8, and last night they partook of an old time Scotch dinner at the expense of Mr. Clayton’s team. There was also the annual match between the president’s and vice president’s team of the St. Andrew’s Club. The president’s team was victorious after a close contest, winning by a score of 10 to 6. On rink No. 3 a scrub match between members of the Thistle Club was held. It was hotly contested from start to finish, and won by Lander’s team, who turned in a score of 19” (“Curling at Hoboken. Robert Lander Won the Point Competition after a Hot Contest,” New York Herald, January 11, 1896, 11). As the above historical snippets attest, the Hoboken Huddle marks a long overdue homecoming for a sport that played a role in Hoboken’s history more than a century ago. “Curling at Hoboken. Robert Lander Won the Point Competition after a Hot Contest,” New York Herald, January 11, 1896, p. 11. “General Sporting Notes,” New York Herald, January 30, 1892, p. 9. Griffith, Janelle. “Super Bowl 2014 Fan Guide: Events in Hoboken.” NJ.com, January 8, 2014, updated January 14, 2014. http://www.nj.com/entertainment/index.ssf/2014/01/super_bowl_2014_hoboken_parties.html (accessed January 24, 2014). “The Thistles are Good Curlers.” New York Herald, January 30, 1892, p. 9. [i] “Canada to Give Arthur Currie Hero’s Funeral: Commanded Dominion’s Forces in War,” Chicago Tribune, December 1, 1933, 20. [ii] “Defends Conduct at Battle of Mons: Gen. Currie, Examined in Libel Suit, Declares No Canadians Fell on Armistice Day,” New York Times, March 12, 1928, 4. 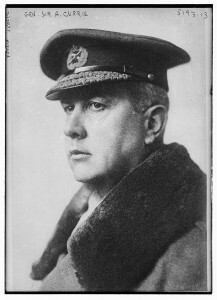 [iii] “Canada to Give Arthur Currie Hero’s Funeral.”; “War Chief will Answer Charge of Cowardice,” Chicago Daily Tribune, April 13, 1928, 12. Given that 2014 marks the one-hundredth anniversary of the outbreak of World War I, it seems fitting to highlight several famous military figures from the First World War who were associated with Cobourg, Ontario. Among the most notable World War I military figures intimately linked to Cobourg was Father Francis P. Duffy. Born in Cobourg on May 2, 1871, Duffy later graduated from St. Michael’s College in Toronto. Thereafter, he relocated to New York City, where he taught at St. Francis Xavier’s College and was subsequently ordained a priest in 1896. In recognition of the intrepid chaplain’s heroic actions under enemy fire during a July 1918 battle, the United States and France bestowed the Distinguished Service Cross and Croix de Guerre respectively upon the clergyman. In the decades following World War I, the exploits of Father Duffy and his comrades captured the imagination of the American public. Their exploits even served as the basis for the 1940 Hollywood action-adventure motion picture, The Fighting 69th, starring James Cagney, Pat O’Brien and George Brent. 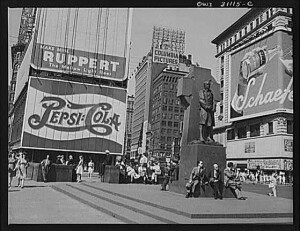 Father Duffy’s indelible influence upon soldiers and civilians alike was also evidenced in May 1937, when a large statute of the beloved chaplain was unveiled on the northern triangle of Times Square in New York City. 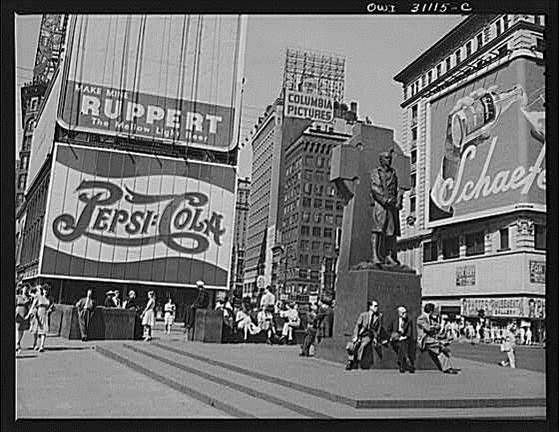 Seventy-seven years later, Father Duffy still stands tall at the site, aptly dubbed Father Duffy Square. Duffy, Francis P. Father Duffy’s Story: A Tale of Humor and Heroism of Life and Death with the Fighting Sixty-Ninth. With an historical appendix by Joyce Kilmer. New York, NY: George H. Doran Co., 1919. Available via Google Books. “Father Duffy Dead; Won Fame in War.” New York Times, June 27, 1932, p. 1. Internet Movie Database. The Fighting 69th. Library of Congress Prints and Photographs Division (Image source). New York City Department of Parks and Recreation. Father Duffy Square. New York, NY: The City of New York, n.d. (accessed January 6, 2014). New York Division of Military and Naval Affairs. “42d Infantry Division Story of the Rainbow Patch.” S.l. : New York Division of Military and Naval Affairs, n.d. (accessed January 7, 2014). A new book by Dr. Marsha Ann Tate, Of Iron and Ozone: The History and Residents of the American Summer Colony in Cobourg, Ontario, traces the transformation of Cobourg, Ontario, a community nestled on Lake Ontario’s northern shore into a renowned North American resort following the U.S. Civil War. The book also highlights the key role played by central and western Pennsylvania industrialists in the development of the Canadian resort which counted among its seasonal residents: a) the wives of Ulysses S. Grant and Jefferson Davis; b) numerous veterans of the Union and Confederate Armies; c) high-ranking federal, state, and local government officials; d) wealthy U.S. and Canadian businesspeople; e) actors and musicians; as well as f) working-class families. In addition, the book includes a comprehensive listing of the names, hometowns, and occupations of Cobourg’s American summer colony residents. Of Iron and Ozone is the first volume in a three-part series of books that explores the multi-faceted relationships that existed between U.S. capital, commerce and tourism in Ontario during the late nineteenth and early twentieth centuries. The book is available on Amazon and Kindle. A comprehensive, month-by-month listing of upcoming Bicentennial-related events is available at The Official War of 1812 Bicentennial Website (http://www.visit1812.com/). No matter whether you are a history buff, are curious about Laura Secord—one of Canada’s legendary female heroines—or are merely interested in taking a unique summer getaway, these and many other War of 1812 related commemorations will make worthwhile and enjoyable additions to your summertime vacation schedules.